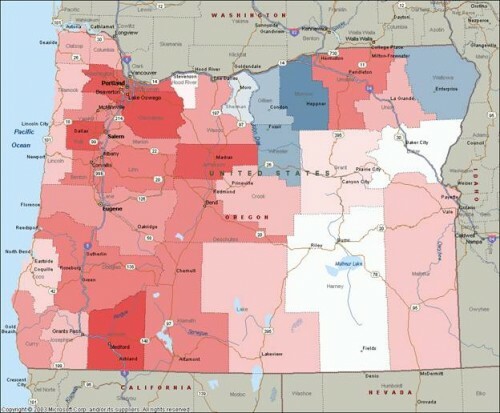 This map represents the relative share of the total number of 2008 Oregon Democratic Primary voters who were Non-Persistent Democrats (see below for definition). The map ranges from red to blue. Red is a higher percentage and blue is a lower percentage. 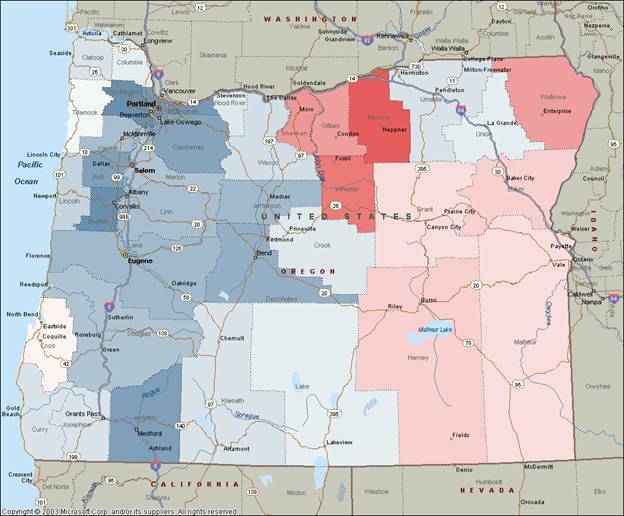 This map represents the relative share of the total number of 2008 Oregon Democratic Primary voters who were Persistent Democrats (see below for definition). The map ranges from red to blue. Red is a higher percentage and blue is a lower percentage. An interesting way to read this map, however, is to reverse it. In that way, the blue maps the share of the voters who were new voters. The typical Democratic Primary voters were to be found in Eastern Oregon and, less so, along the Coast. The newer voters were in the more liberal areas and in the fastest growing cities. This post begins a series that analyzes results from the 2006 San Jose Mayoral contest. Reed’s support was spread throughout the city. 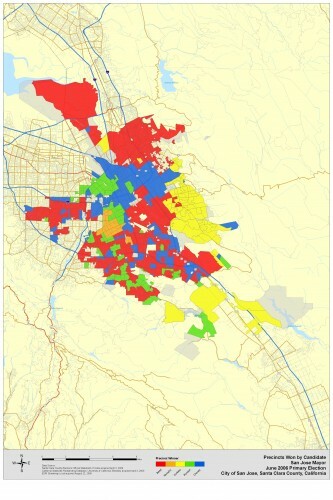 Chavez’ support was largely in central San Jose. Cortese’s support was largely in southeastern San Jose. Mulcahy’s support was concentrated in one southwestern area. Pandori’s support was scattered. These results parallel the vote propensity findings presented earlier. Persistent Democrats are more likely to vote earlier. New Voters are most likely to vote later. The Party Switchers, since many have higher vote propensities than the Non-Persistent Democrats, are the second most likely to vote earlier. Non-Persistent Democrats are the third most likely group to vote earlier. Definitions of Voter Categories: Persistent: Democrat who voted in one or more of the previous two primaries (2004/2006). Non-Persistent: Democrats who did not vote in either of the previous two primaries. Switchers: Those who re-registered as Democrats from another registration category (Republican, Non Affiliated Voter, etc.). New Voters: Those who registered to vote in the three months prior to the election. This result, specifically, is a preliminary result in a larger research project examining how the new voters in the 2008 Oregon Democratic Primary behaved. Those who have voted more often in the past are more likely to vote earlier in this vote-by-mail election. Vote propensity is number of the previous four Primary and General Elections that the person voted in (2004 Primary and General and 2006 Primary and General). In general, the opinions a person has about the 49er’s plan and about the A’s plan are highly correlated. There are close correlations between those who strongly disapprove of both plans (see lower right of graphic) and those who have no opinion (see lower left of graphic). In addition, the approvals are clustered together (upper left quadrant) and the less strong disapprovals are clustered together (upper right quadrant). Correspondence Analysis was used to construct the graphic. Voters from the 2nd Congressional District (Eastern and Southern Oregon) tended to return ballots faster than those from the 3rd Congressional District (Portland). In general, rural areas have historically tended to return their ballot earlier. This is probably due to a combination of factors including average distance from the county seat and average age of the voting population. Ballot returns from the other congressional districts were between these two extremes. The BART plan is a different animal than the 49er’s and A’s plans. Here, as with a typical development project, greater familiarity does appear to breed disapproval. This is very common and to be expected. The support for BART is being driven by the large number of people wh0se famliarity is in the middle. One way of thinking of this is that these people have all the information they need to know or want to know to approve of BART. Just like with the 49er’s, famliiarity for the A’s plans breeds approval. However, since the plan has been out in public for a shorter period of time, the connection is as strong. How familiar are you with moving the A’s baseball team to San Jose? Is that very familiar, somewhat familiar, somewhat unfamiliar or very unfamiliar? This graphic shows the ballot return date for 2008 Oregon Democratic Primary voters based on the household party mix. In other words, since we know at least one was a Democrat, what were the other parties, if any, in the household? The options are no other party (pure Democrat) and Republican or Independent (Other party or Non-affiliated voter) or both other parties. What one finds is that households that include Independent voters were relatively slower turning in their ballots. “Democratic” and “Democratic and Republican” households That Independents are slower to turn in their ballots has been well documented, what is interesting here is that there is an apparent household effect. This probably has something to do with the other, social, factors that lead to people becoming independent voters.